Albuquerque has great weather, with warm, dry summers and cool, temperate winters. Most people think of Albuquerque as being in the desert, which it is. But Albuquerque is in the "high desert" because of its high elevation, which helps keep it cool. New Mexico's topography consists mainly of high plateaus and mesas, along with mountain ranges, canyons, and arroyos. 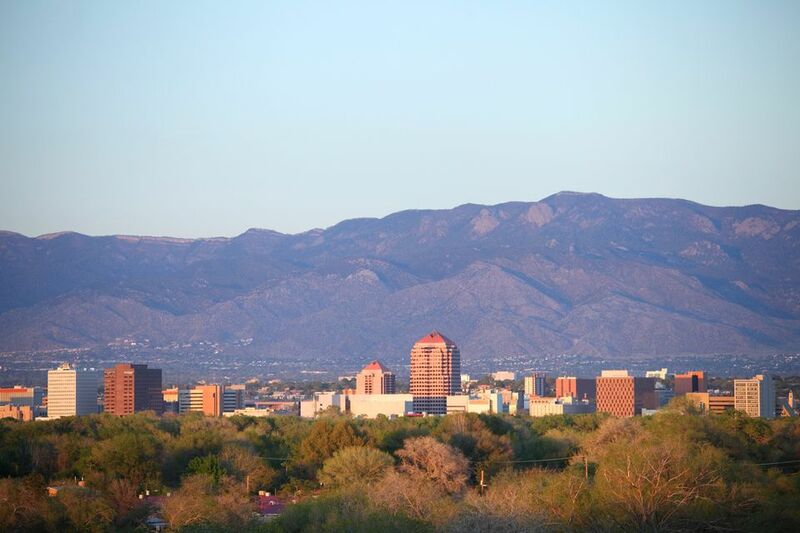 The average elevation is 4,700 feet above sea level, and Albuquerque is on average at an elevation of 5,000 feet. Why isn't it the Mile High City, then, like Denver? Because some areas of the city are well over 6,000 feet (the foothills) and some are below 5,000 feet (the valley). The average temperatures for the Albuquerque area may vary by a few degrees. But the average high usually hovers around 69 degrees, and the average low is about 45 degrees. The median temp is a comfortable 57 degrees. Some temperatures can be taken from the official weather monitor at Albuquerque International Airport, while others, like the temperatures below, can be found within the U.S. Climate Data site. The north and south valley and Los Ranchos may have slightly cooler temperatures on average, and the Sandia foothills, with neighborhoods such as High Desert, will on average be several degrees cooler than the official Albuquerque reading. Winter is usually mild in Albuquerque, with temperatures in the 40s. February is a good time to go skiing around Albuquerque, just make sure to book hotels a few weeks in advance. April is a good time to visit as the temperature hits the 70s—but keep in mind that seasonal winds can mean cooler breezes. You may want to pack a light jacket. May is the month of sunshine and blooming flowers. It's also warm and in the mid-70s. June starts off the summer in the mid- to high-80s. July and August are the two rainiest months of the year. This also means there are less crowds—especially with the high heat. Afternoon showers are common in August. September is one of the most beautiful months for weather, hovering at a comfortable 80 degrees. Just make sure to book hotel rooms in advance. October is an extremely popular time of year. The Albuquerque Balloon Festival is hosted in the first half of the month. In November, the temperature dips back down right in time for Thanksgiving. December is a super popular month thanks to the Christmas and holiday festivities. Plus the weather typically doesn't dip below freezing. How Much Does It Snow in Albuquerque?